Weapons are a precious commodity in Grand Theft Auto IV. The number of attainable weapons in GTA IV has dropped to 15. In-game weapons are harder to find, and have been moved to the top of buildings and back alleys, out of the way, although weapons are commonly found before big "shootout" missions in plain sight for the player to find. Weapons and ammo that have been dropped by fallen enemies now realistically lie on the ground with a distinctive red-orange glow to catch the player's eye, instead of floating in mid-air like in other Grand Theft Auto games. The weapons in GTA IV have 2 strength tiers, instead of 3 levels, like in Grand Theft Auto: Vice City and Grand Theft Auto: San Andreas. Also, the guns do not have specific names, probably for legal reasons; instead, weapons have been given more generalized names (for example, the AK-47 is called the Assault Rifle and the Desert Eagle is called the Combat Pistol). Much like the real NYC, the civilian sale and ownership of firearms in Liberty City is illegal, but just as it is with real life criminals, Niko Bellic and friends don't seem to mind breaking the law in order to arm themselves. Keeping in line with the political reality satirized by the game, the Ammu-Nation shops found in previous GTAs have been closed down due to strict gun laws. Taking their place, however, are a number of shady, underground gun shops located in basements and alleys around the city. Additionally, if the player has earned enough respect with Little Jacob, the player has the option to call him to meet the player nearby with a vehicle full of weapons at a reduced price. With the exception of Thrown Weapons, the player no longer needs to purchase multiple instances of firearms in order to stock up on ammunition, instead the player buys one gun and pays a smaller amount for each additional magazine. However, the player now has a limit on how much ammunition he can carry for each weapon. Additional weapons are available in the downloadable episodes of Grand Theft Auto IV: The Lost and Damned and The Ballad of Gay Tony. 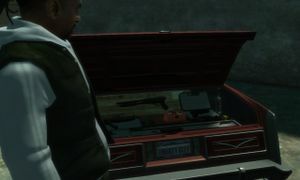 The player can contact Terry Thorpe or Armando Torres for weapons delivery in the episodes, respectively. Melee weapons are used when the player does not have any firearms or when a situation does not call for one, such as a mission where the player must threaten a target without killing him. Unarmed, the player is able to dodge attacks, disarm opponents, and perform ground punches and kicks, lefts and rights, and uppercuts and jabs. Moves can be strung together to create a combo. On some occasions, the player can perform "Stun" hits. Fighting unarmed is the best way to fight someone without killing them, something that can be important in several missions. With the fist selected as current weapon, the player can pick up random objects off the streets, such as a brick or a bottle, however the player cannot switch weapons while an item is picked up, unless the item is a thrown item such as a brick. Oddly, all items on the street that the player picks up do the same damage when thrown at someone. Knives are very efficient alternatives to firearms. Even a well-armored adversary can be taken down with 3 to 6 slashes. They are very efficient at taking someone down without getting police attention. This is helpful on the street and in missions when attracting police attention isn't the best idea. Unlike San Andreas however, the player cannot execute stealth kills with the knife. The bat can be swung left or right. The player can also block attacks with it. The bat can be useful when the player doesn't want to draw attention to themselves, since it is considered a "silent" weapon, though less so than the Knife. The bat is a superior weapon against an unprotected opponent to the Knife, as it will often knock them down them in one or two blows rendering them defenseless. In The Lost and the Damned, the Baseball Bat can be used to attack enemies during a motorcycle race. Thrown weapons are useful when engaging groups of enemies. Thrown weapons in GTA IV are more versatile than they were in the GTA III Era; thrown weapons can be thrown forwards with precision aim, dropped by pressing the fire button without holding the aim button, or thrown from vehicles. Carelessness with thrown weapons, such as overcooking a grenade or walking into flames caused by a Molotov, can result in the player's death. Carrying capacity for thrown weapons is 25 units. NOTE: If the player switches from one thrown weapon to another, the player loses all units of the previous weapon. The Molotov Cocktail, named after 1920s Soviet politician Vyacheslav Molotov, is a crude but effective weapon that creates a large burst of flames on the target. When thrown forward, it is thrown overhanded, which helps to ensure that the player throws it far enough that he doesn't burn himself. The player can also toss Molotovs behind himself to fend off pursuers. They are primarily an anti-personnel weapon as long term exposure to flames is required to destroy a vehicle. Any target caught in flames is defenseless while burning, allowing the player to finish off his target(s) easily. The player must be careful not to get burned himself as the player loses a large portion of his health or armor when burned, and is left thrashing on the ground until they put themselves out, vulnerable to further attack the entire time. Based on the M26A1 variant, the grenade is excellent at clearing rooms full of enemies and taking out vehicles. Grenades can be tossed underhanded, thrown overhanded, or dropped from behind while running. The player can shorten the detonation timer by cooking a grenade, which is done by holding the fire button. When cooking a grenade, it begins beeping if held for too long. The grenade is an effective drive-by weapon, as a well timed grenade can disable or destroy a pursuing vehicle, but the player must be careful not to catch his own vehicle in the explosion. Handguns are the most widespread firearms in the game. While not particularly powerful, handguns can be very effective when used properly, especially when the player aims for the head of a target. Handguns are best suited for close to medium ranges. Handguns can be used from a vehicle, but it is recommended that the player use a submachine gun for that purpose instead if one is available. Handguns are the only weapons which can be used for a cinematic execution. Carrying capacity for handgun ammunition is 1,500 rounds. Developed in the 1980s by Austrian engineer Gaston Glock, the eponymous pistol soon became the world's most popular civilian and law enforcement sidearm. With its polymer frame and simple, internal striker-fired mechanism, the Glock series of pistols is both lightweight and extremely durable. The in-game variant is a Glock 22 with an optional 17-round magazine equipped. It is the standard pistol for most of the game, and it is the standard sidearm of all law enforcement agencies in Liberty City. It has a decent range when shooting, and takes about 3 to 5 body shots to kill an unarmored target. In 1979, Magnum Research Inc. set out to create the first gas-operated, magnum-caliber pistol. While the end product is generally considered too heavy and too expensive to serve as a practical combat pistol, its appearance in several works of fiction has made it popular in the civilian market. The variant in the game is the nine-round .357 Magnum version. It has better stopping power and range than the Pistol, but it has a silghtly slower rate of fire because of recoil and a smaller magazine capacity, forcing more frequent reloads. Shotguns are somewhere between Pistols and SMGs. They are extremely powerful at close to mid range and are often one-to-two hit kills. They deal far more damage per shot, but fire far more slowly to compensate, so they aren't ideal when fighting a large group of enemies while running-and-gunning out in the open. They are best used while using cover for laying down a small number of enemies during close combat and for surprise attacks for that quick kill. Carrying capacity for shotgun ammunition is 80 shells. Based roughly on the classic Ithaca Model 37, the Stakeout is a pump-action shotgun made in large numbers for the civilian, military, and police markets. The pistol grip and shorter overall length makes it perfect for home defense and law enforcement. It is more powerful than the Combat Shotgun due to its short barrel and wide field of fire, but can't shoot as fast or as far to compensate, making the weapon best suited for close-quarters combat. The Pump Shotgun's design suggests that its tube magazine should only hold 4 rounds, yet in-game, it holds 8 rounds, likely to reduce the number of reloads needed. NOTE: Little Jacob does not carry the Pump Shotgun. This semi-automatic shotgun is a powerful tool for disposing of enemies quickly and efficiently. This seems to be based on the Beretta 1201 FP, but with the barrel of a military Remington 870. Although it burns through ammo quickly and not as powerful as the Pump, it is useful for holding back enemies and saturating an area with large amounts of lead, and has a far greater range than the Pump Shotgun. It can be obtained when the player enters a police car, however law enforcement never use this weapon, opting to use the Pump Shotgun when engaging the player. In The Lost and Damned, the Combat Shotgun is supplanted with a carbine model, which it bears a pistol grip and a retractable stock very similar to that of the Carbine Rifle; it also has a picatinny rail on top of the gun. All of its other attributes remain the same. NOTE: Armando does not carry the Combat Shotgun, instead stocking the Explosive/Automatic Shotgun in its place. Submachine guns are the next step up from shotguns. They're most effective at close-to-medium range while running and gunning at targets to quickly cycle through them to finish them off, but are ineffective at long distances. The player should fire semi-automatically or in bursts when engaging mid-range targets and only fire in full auto when confronted up-close. These are preferred over pistols when doing drive-bys or chasing down an escaping car and are the strongest weapons that can be used while doing so, unless the situation allows Hand Grenades to be employed. Carrying capacity for submachine gun ammunition is 1,200 rounds. The smallest member of the Uzi family was introduced by Israel Military Industries in 1982 as a security weapon to fill the firepower gap between pistols and standard submachine guns. Because of its short barrel and high rate of fire, its range and accuracy is limited when fired full auto, but makes up for it with its huge spray of bullets. The Micro-SMG's 50-round magazine capacity makes it a good blindfire & drive-by weapon. NOTE: Armando does not carry the Micro-SMG, instead stocking the Gold SMG in its place. The MP-10 is a heavily modified MP5, a cross between a standard model and its shortened variant, doing away with a buttstock and fitting a polymer grip with a flashlight and a Picatinny rail on top. In comparison to the Micro-SMG, it is far more accurate, but has a slower rate of fire and smaller magazine. Not much is really known about it, as it is apparently made in very small numbers by an equally small and mysterious company called SW Arms (not to be confused with Smith & Wesson). NOOSE and FBI agents use the SMG from their vehicles at higher wanted levels as they attempt to stop the player. The iconic assault rifles fill the niche between sniper rifles and SMG's. While they are more powerful and accurate than SMGs, assault rifles are also more expensive and cannot be fired while operating a vehicle, but can be fired from any of the three passenger seats of a helicopter or boat. Assault rifles are most effective when fired semi-automatically or in bursts at medium to long ranges. From assaulting a building full of bad guys to fending off law enforcement, assault rifles are excellent combat weapons. Carrying capacity for assault rifle ammunition is 600 rounds. Even after sixty years, Mikhail Kalashnikov's legendary AK-47 rifle is still a hard act to follow; both in reliability and popularity. Created with mass production in mind, the simple design and loose clearances resulted in a rifle that's practically indestructible, and that will remain functional with little maintenance or cleaning. The AK is a more powerful rifle than the M4A1, but less accurate at longer ranges. The M4A1 Carbine entered service in the late 1990s-early 2000s as an automatic modification for the original Colt M4 in service with the United States military (which had a "safe-semi-burst" trigger group) to fill a special forces order. Due to the events of the 1997 North Hollywood Shootout, Police Forces now have access to these rifles as well. It is gas-operated and air-cooled, with a cyclic firing rate of 700 to 900 rounds per minute. Overall length is 33 inches (with stock extended) and the barrel length is 14.5 inches. The Carbine is more accurate than the AK-47 but less powerful. It mounts a small sight on the receiver's Picatinny rail, but no attachments can be mounted on it. It can be acquired from most NOOSE officers and FIB agents as well as certain LCPD officers, specifically those who guard subway stations and landmark areas. Sniper rifles are unmatched in precision long range shooting. Sniper rifles are far more accurate and powerful than assault rifles, but they have low rates-of-fire and small magazine capacities, and so should be quickly switched out for a more suitable weapon when confronted up close. Sniper rifles are good getting the jump on enemies by picking them off from a safe distance, and for providing far-away sniper support for friends in a heated gun battle. Carrying capacity for sniper rifle ammunition is 50 rounds. The Remington 700 is a popular hunting rifle that can be found chambered in a wide range of calibers and was later adopted by the military as the M24 and M40 sniper rifles. Strangely enough, the one in the game appears to have been further customized to use an external 10 round magazine, yet it only holds 5. It is a powerful rifle, but has a slow rate of fire due to its bolt action mechanism. The PSG-1 is a sniper variant of the H&K G3, used by the elite German anti-terrorist unit GSG 9 as a dedicated-marksman rifle and popular in film and television. The rifle is built to extremely tight tolerances and is deadly accurate in the hands of a skilled operator using match ammunition. It is semi-automatic, allowing for more rounds on a target than the Sniper Rifle, however it is not as powerful. This classic, widely-produced, portable, shoulder-launched, anti-tank rocket propelled grenade weapon was first used by the Soviet Union in 1961. The ruggedness, simplicity, low cost, and effectiveness of the RPG-7 have made it the most widely used anti-tank weapon in the world. The RPG can be blindfired and even skipped off the ground and knock things around that are in its way. The weapon is aimed from the over-the-shoulder perspective, allowing the player to strafe while aiming, unlike previous games where the player was forced into a stationary first-person perspective. A direct hit with a rocket destroys most vehicles and heavily damages any nearby vehicles within its blast radius. Also, any victim caught in the blast radius or near a exploding vehicle is instantly killed or suffers a heavy amount of damage; however, using the RPG as an anti-personnel weapon is not recommended. The rocket self-detonates when it reaches its maximum range. The player does not need a direct hit on the fuselage of a helicopter to take it down as the force of the detonating rocket can cause a helicopter pilot to lose control and crash. It is, by far, one of the most lethal weapons in the game, however, misuse of the RPG can result in the player's own death. NOTE: Little Jacob does not carry the Rocket Launcher, but in the beta release, he carries it strapped underneath his car. This pistol was going to be featured and was shown in a screenshot before GTA IV was released. An equivalent weapon is featured in The Ballad of Gay Tony DLC, but modeled after a semi-automatic AMT Automag. Just like the Python, a silenced pistol was spotted in a pre-release screenshot, but was cut before the game's release. This page was last modified on 28 January 2013, at 21:07.